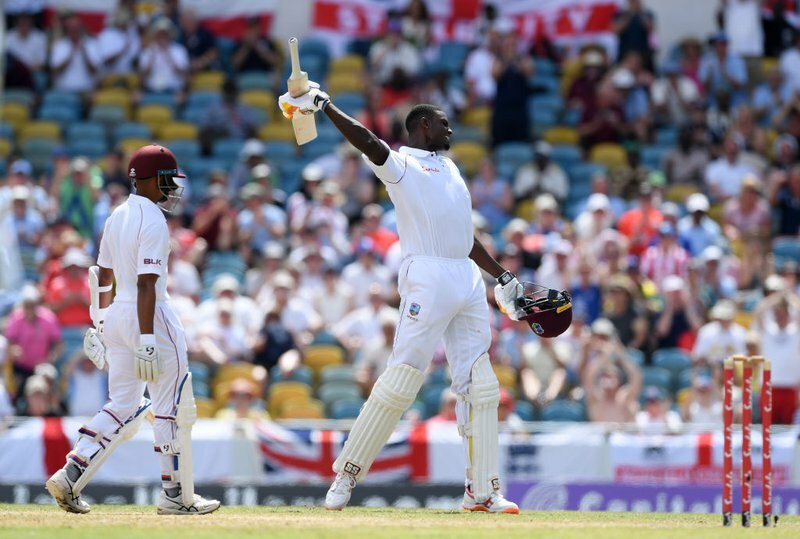 BRIDGETOWN, Barbados – Jason Holder fulfilled his immense batting potential with a masterful, maiden Test double hundred and Shane Dowrich silenced his doubters with a resolute, third Test hundred, putting the WINDIES in an impregnable position and leaving England with a mountainous task to save the first Wisden Trophy Test. 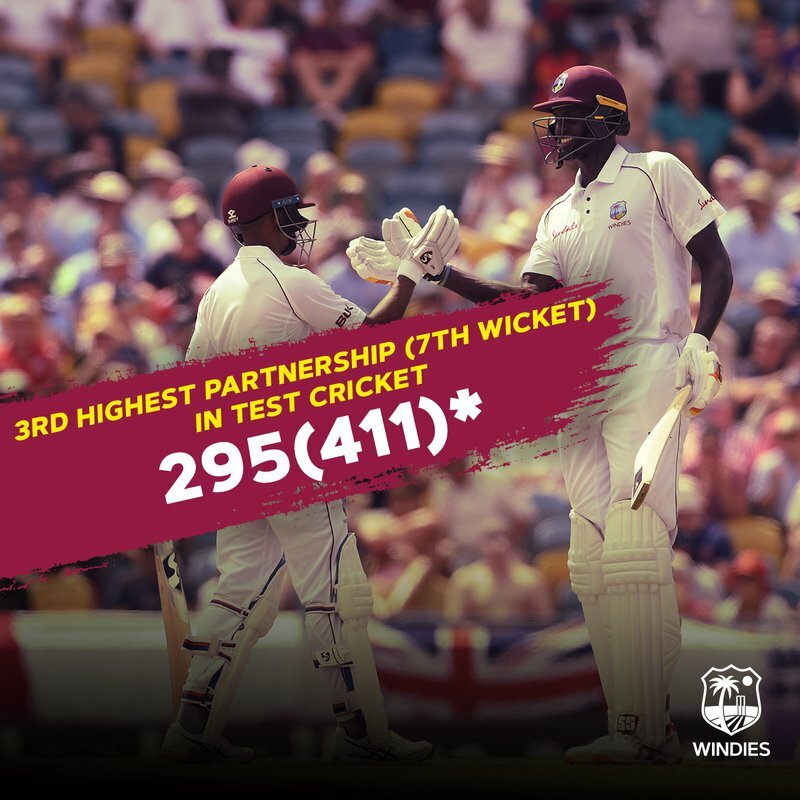 Holder, the WINDIES captain, was undefeated on 202 – also his third Test hundred – and Dowrich was unbeaten on 116, sharing a record, unbroken, 295-run stand for the seventh wicket that allowed the hosts to declare on 415 for six in their second innings about 40 minutes after tea on the third day at Kensington Oval today here. To the tumultuous roar of a near capacity crowd, hometown boy Holder swung a short delivery from part-time medium-fast bowler Keaton Jennings to deep mid-wicket to reach the milestone from 229 balls and signal the declaration following his celebration. 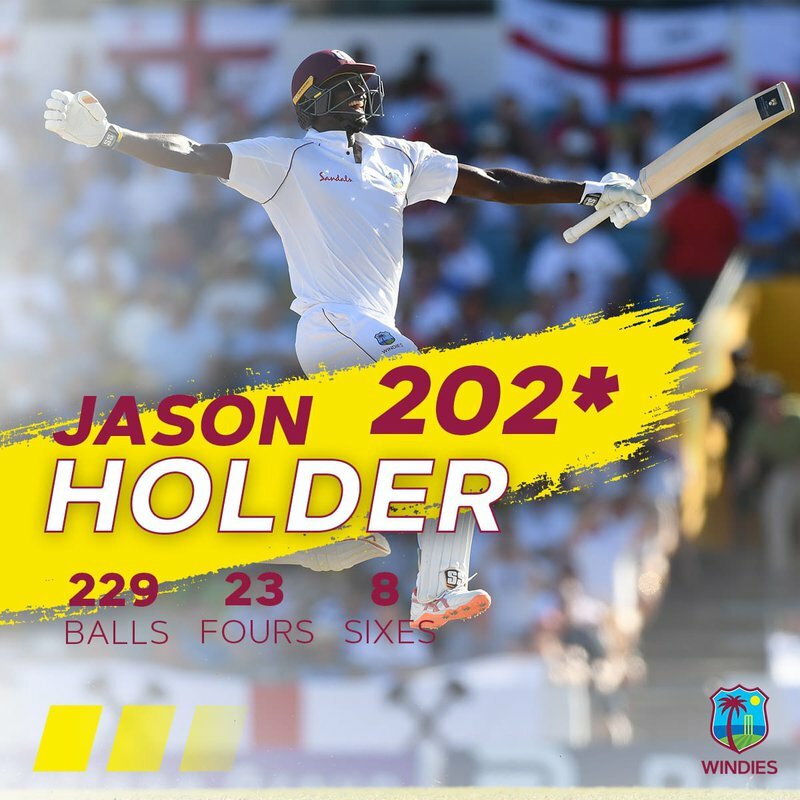 Along the way, Holder became the third player batting at eight to score a Test double hundred, compiled the highest score by a WINDIES batsman occupying the same position and struck the highest number of sixes – eight – by a WINDIES batsman in a Test innings against England. 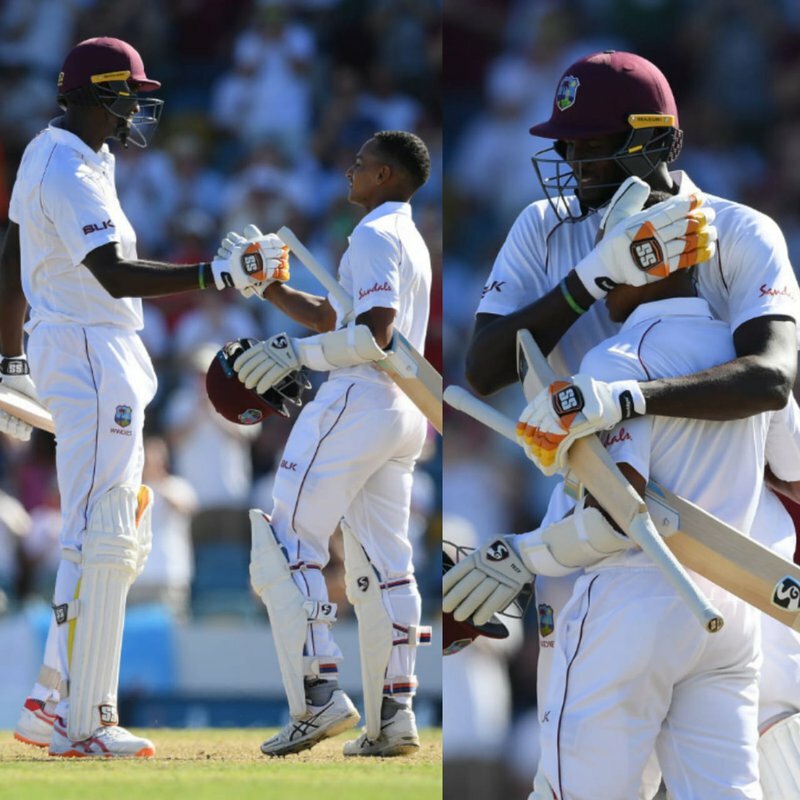 The stand between Holder and Dowrich – the 3rd highest 7-wicket partnership in history and the highest undefeated seventh-wicket partnership in Test history – erased the mark of 204 shared by Marlon Samuels and former WINDIES captain Darren Sammy against the same opponents seven years ago at Trent Bridge in Nottingham, England. When stumps were drawn, Rory Burns, not out on 39, and fellow left-handed opener Jennings, not out on 11, had helped to temper the euphoria and carried the visitors to 56 without loss in their second innings, ensuring that not a wicket fell for the day – a stark contrast to the previous day when 18 tumbled. Resuming from their overnight 127 for six and a healthy lead of 339, many expected a WINDIES declaration pretty early in the day. 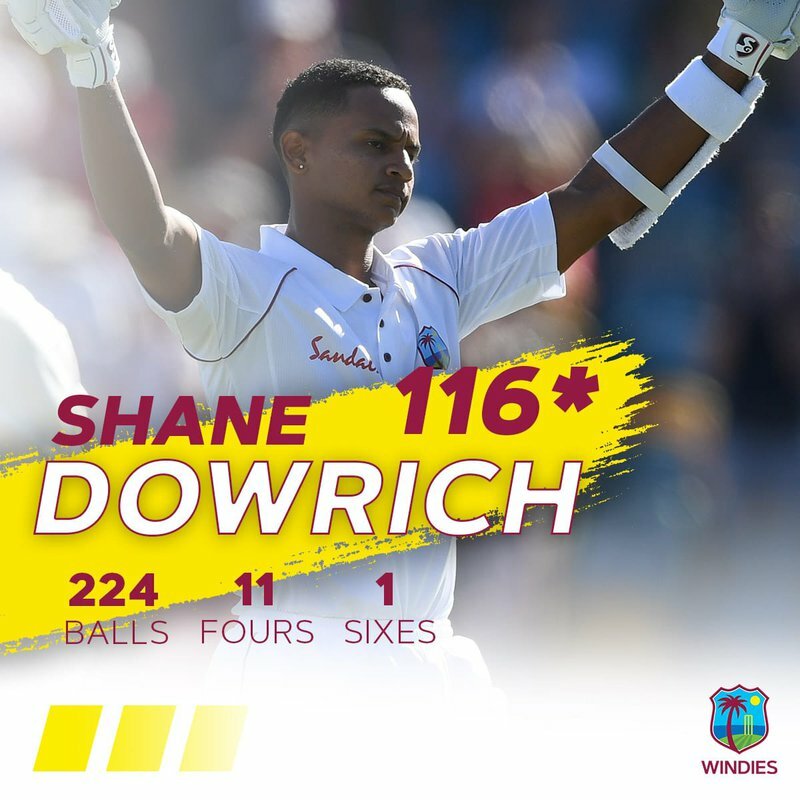 But Holder was clearly not satisfied and with Dowrich prepared to play the supporting role, they turned the screws on England, carrying WINDIES to 237 for six. Holder struck off-spinner Moeen Ali for three consecutive fours – between cover and long-off – and his third six of the innings, when he lofted a delivery from Sam Curran over long-off to bring up the century partnership with Dowrich. Just prior to the interval, Holder had a close call, when he miscued a drive and skied a ball into the point region, where Burns – one of three fielders circling underneath – only managed to get his fingertips to it. After lunch, Holder and Dowrich continued merrily to propel the WINDIES to 349 for six at tea and stretch the lead past 550, as they further frustrated the visitors, who utilised seven bowlers without success and employed the second new ball after 80.1 overs. 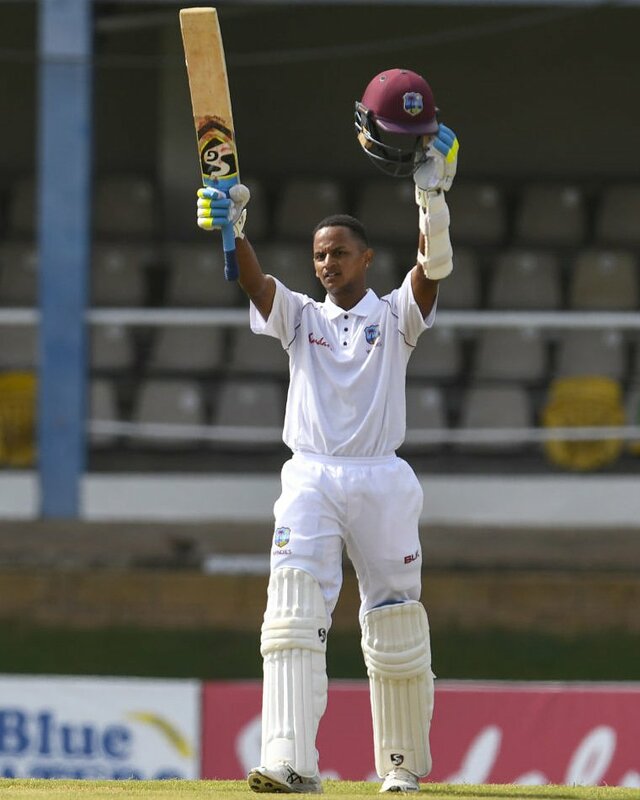 During the period, Holder brought up his hundred off just 99 balls with a six over long-off from the bowling of leg-spinner Adil Rashid, greeted by huge applause that included several WINDIES legends like Sir Garfield Sobers and Sir Everton Weekes. A few balls earlier, fortune favoured Dowrich when he survived an lbw appeal off England captain Joe Root, bowling leg-spin, which television ball-tracking technology suggested would have been out, had England not run out of reviews. Dowrich was the perfect foil for Holder and never got caught up the moment. He hit a few rasping drives that were eye-catching and a delight to the crowd to move easily through the 90s before he reached his hundred from 198 balls, when he cut Ali to the point boundary in the third over after tea.